My operating session today was at the Central Vermont Railway, a new layout focused on Timetable and Train Order operation. I ended up being the conductor on two trains, one in the morning and one in the afternoon. 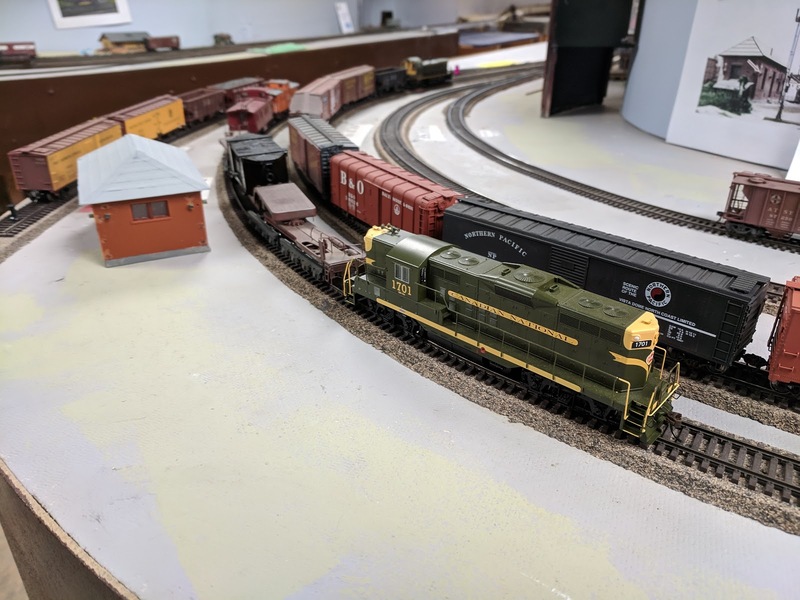 This model railroad runs impressively well and is a lot of fun. Regular readers might have noticed by now that I love railroad paperwork. 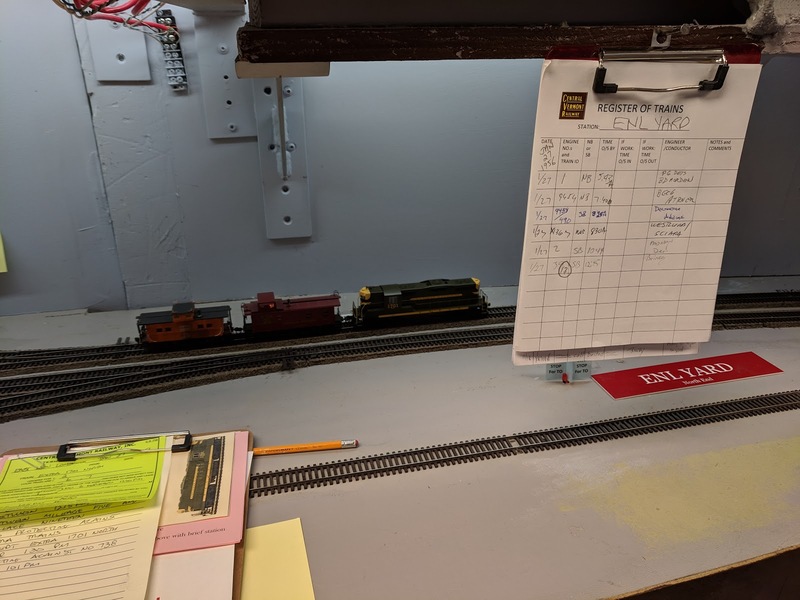 Timetable & Train Order operating layouts produce a lot of paperwork, and this layout is no exception. Here you see me as conductor on Extra 1701 North, and I'm obviously waiting for something. What happened? 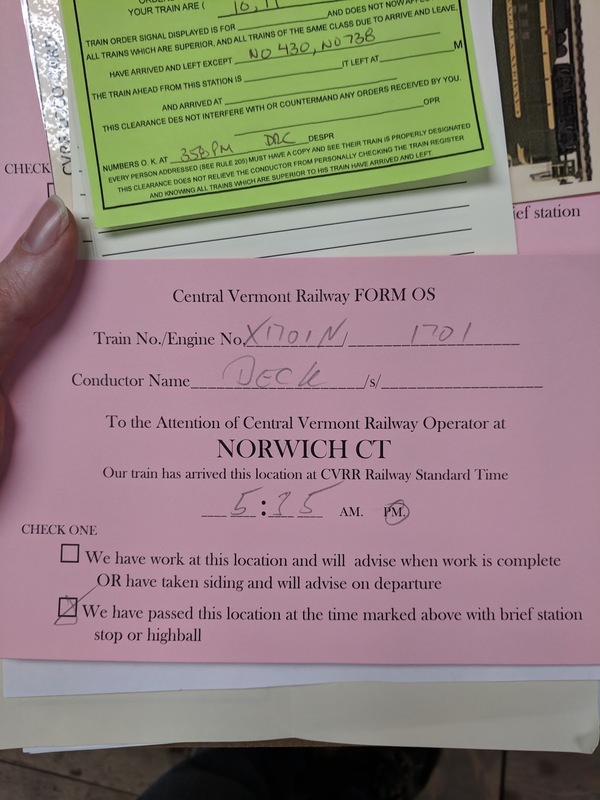 The CVR runs two-man crews, so for the afternoon session we reported to duty as conductor and engineer for a 12:50 pm departure and picked up our paperwork. 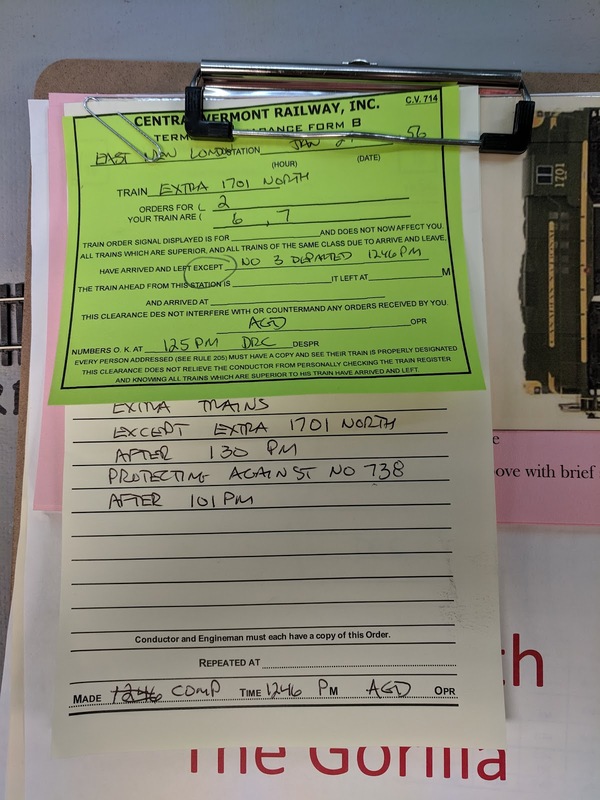 Clearance Form B shows that the preceding northbound passenger has left a few minutes earlier and all other higher priority trains have arrived or departed. 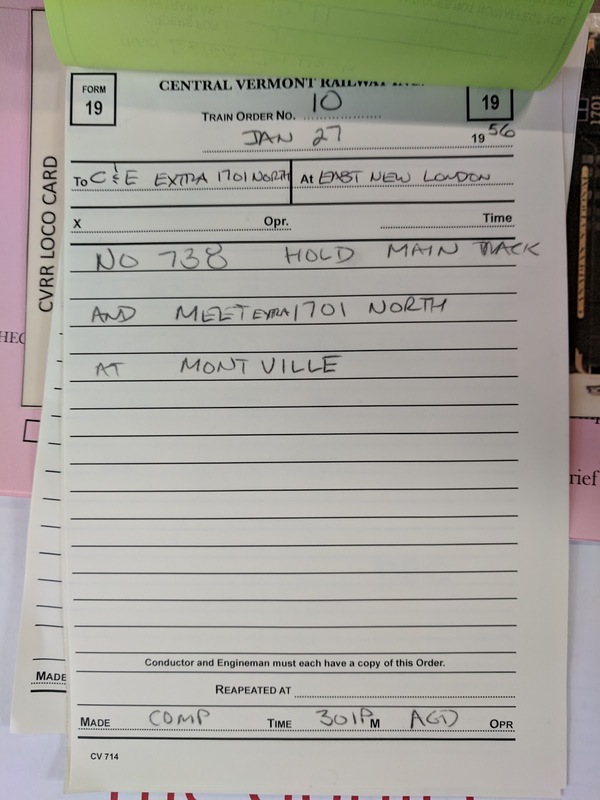 However, when I read the order during the session I concentrated on the first part telling me where to expect Extra 1367. 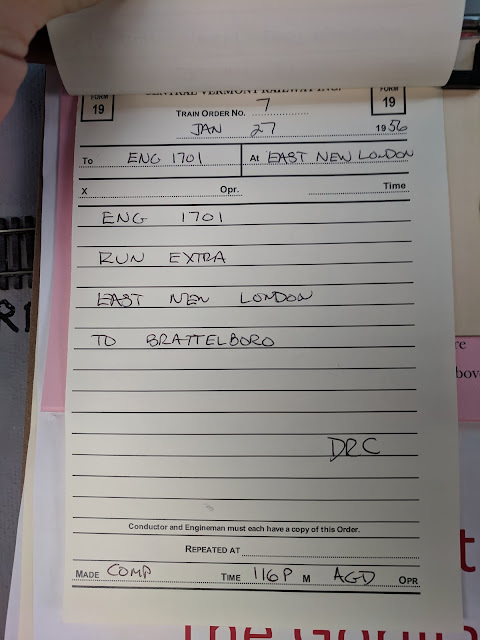 The other order is the authorization to occupy the main line and run north from East New London to Brattelboro. I have a clearance. I have authority. I know there's someone ahead of us. I'm told all superior trains have arrived or departed. We're ready to go and pull out of the yard onto the main line. 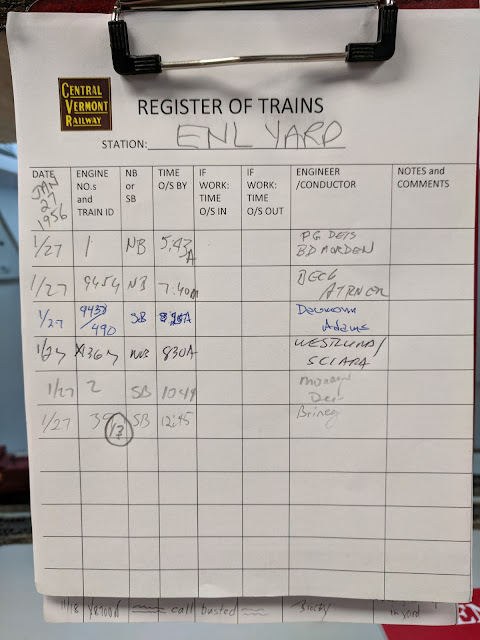 At the north end of the yard is the train register where all inbound and northbound trains are logged. 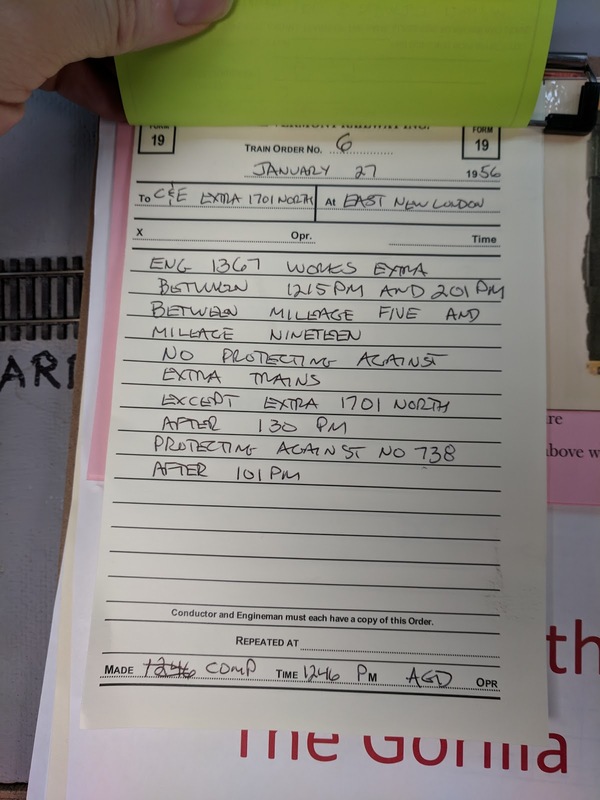 I double-check the schedule, the only opposing train that could possibly interfere with us is train 738, so I verify that train 738 signed the register... Uh oh, they did not. We're on the main line and we are on their time, so I tell the engineer to pull into the engine siding at the north end of the yard to clear the main line. Head-scratching ensues. My paperwork is obviously not consistent with reality. I chat with the yardmaster and walk back to the East New London station agent, while the engineer sits in the siding with the train. 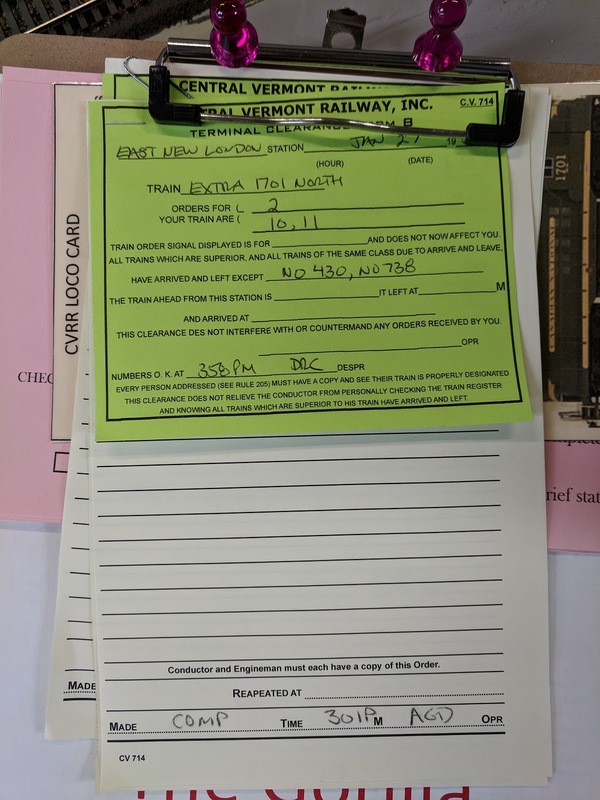 The station agent checks in with the dispatcher and eventually confirms we'll get additional orders. 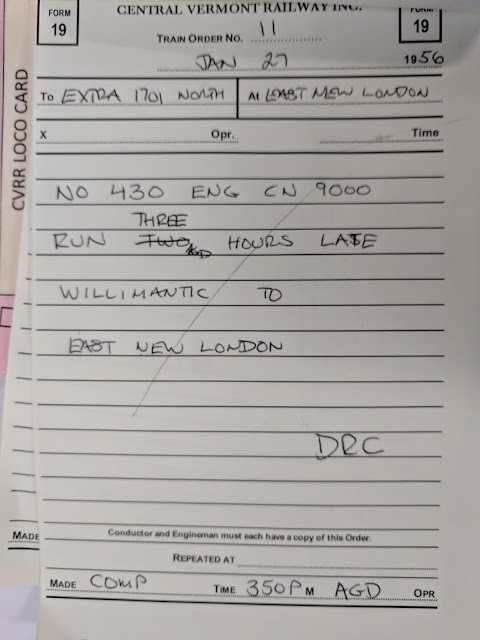 Since all orders are dictated to the station agent by the dispatcher over the phone and the dispatcher has to run the rest of the railroad as well, that will take a while. We can't leave until we have orders. This is when the photo above was taken. Eventually, we got additional orders with another clearance form B, this time advising on trains 430 and 738 and I know from the schedule that southbound first class passenger train 4 is also coming our way later in the afternoon. 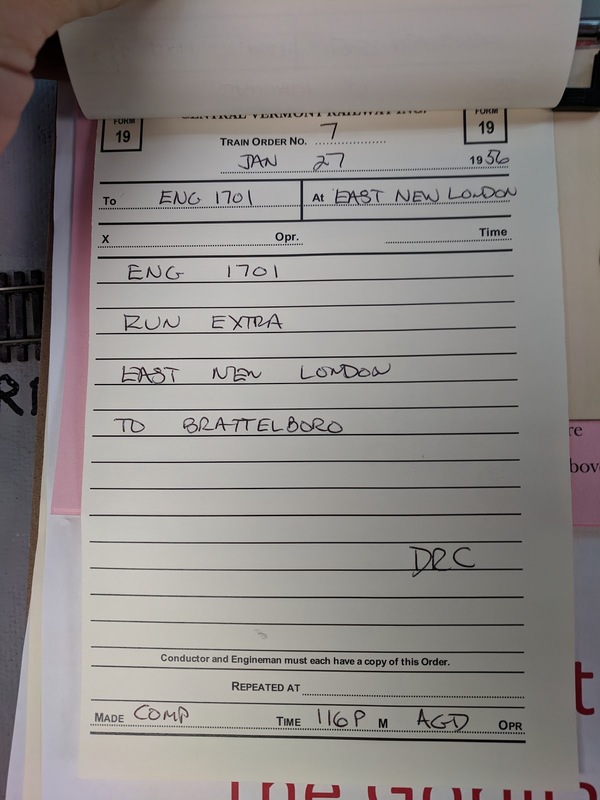 In the first order the dispatcher sets up an explicit meet for us to meet train 738 in Montville, which is 5 miles north from East New London Yard. With the second order the dispatcher lets us know that train 430 is running 3 hours behind schedule. 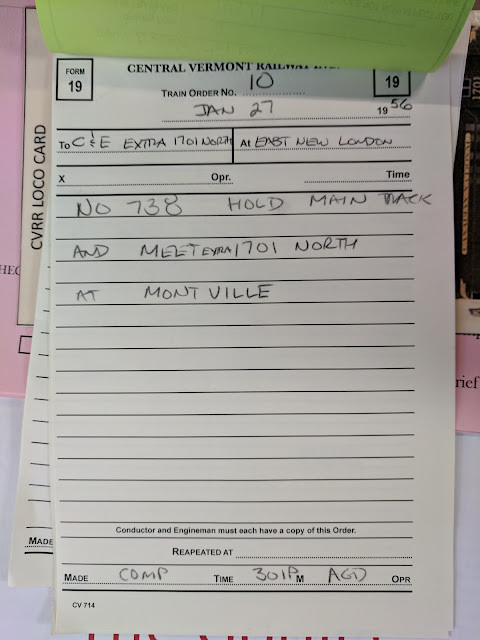 Taken together the two orders allow us to occupy the main line to Montville, work in Montville and beyond until it's time to meet train 430. 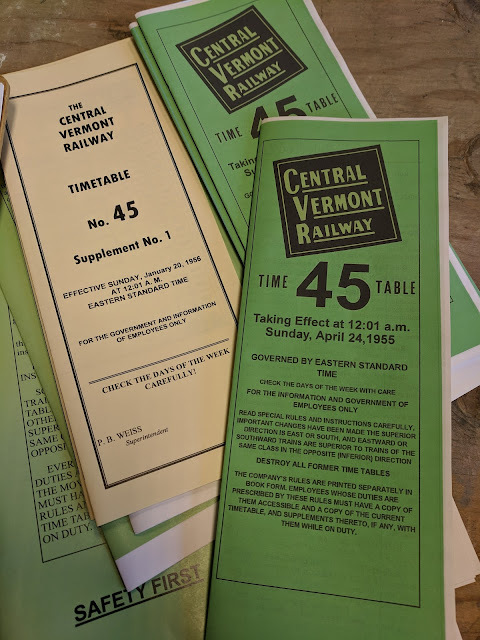 Half a dozen sheets of paper and several fast-clock hours of work to move a train. I very much enjoy this low-tech way of running a railroad, but it really only works well on large layouts like this where distance between sidings, the interaction between dispatcher, station agents, and engine crews contribute to the mental exercise of working with and interpreting orders and the schedule. 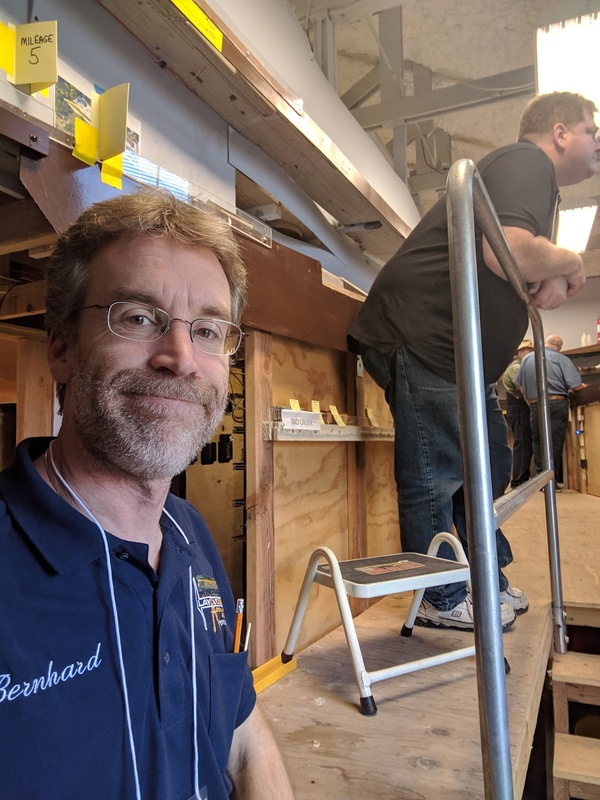 And sometimes you get stuck in a siding for a while, especially if you're an Extra in the Inferior Direction of the railroad.